AND YES, THERE’S A BATHROOM! 8 East to 111 North to S80 E Evan Hewes Highway then jump on the 115 North and go East on the 78. Last gas station is on 4th Ave in El Centro. that’s the entrance/gate to Glamis. There will be a $50 State grounds fee at the gate or $35 on the web If you pass the train tracks you’ve gone too far! Once you enter you’ll head to Wash 6 and go right. YOU CAN’T MISS US! 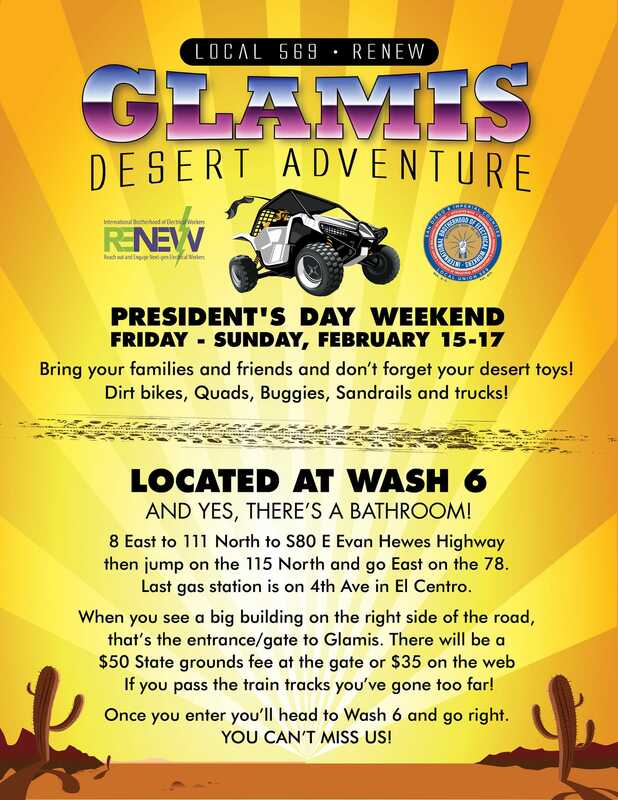 Bring your families and friends and don’t forget your desert toys! Dirt bikes, Quads, Buggies, Sandrails and trucks! The Reach out and Engage Next-gen Electrical Workers (RENEW) initiative is to inspire the next generation of IBEW workers to be more active in our local!